ricardo wrote: The one item we haven't added in this investigation is the effect of the optimum load capacitance. I was looking at the Jensen MC transformers last night. It surprised me to see that their test circuit loaded the secondary with a C as well as an R. That's the first time I've seen that for an MC cart. I ended up nowhere near the recommended load for the DL103 with the Lundahls. Off by a factor of 10x. The transformer is 1:16. R2 and R3 of the preamp are 1MΩ. This measured 100kΩ differentially. My load resistor is 221kΩ. That's 221kΩ in parallel with 100kΩ if I have that right. I come up with 68.85kΩ. Right? Any lower value sounded darker and higher values didn't make much of a difference. It still sounds darker than the source. it sounds like there is not much above 12k or so. The sheet that comes with the DL103 shows it ruler flat to 20k. The roll off miraculously is like a tape hiss reducer so I think it might have been designed in on the sly. Or it could just be the limitations of the conical stylus. This is for QC and I like the way the DL103 breaks up. It doesn't sugar coat things. IIRC Deane Jensen would terminate transformers with RC to flatten out the response of the transformer...So may not be optimal for cartridge loading. I don't understand the desire to provide a phono preamp that does not have the RIAA de-emphasis EQ built into it. Since the vast majority of LP's were recorded using analog filters for the RIAA emphasis, then they have phase shifts that are built into the LP itself. The analog RIAA de-emphasis EQ has the opposite phase shifts so I think that the way to correct the response in both amplitude and time domains is to use an analog filter instead of a digital one. The purpose of flat recording is to make DSP-based de-clickers work better. I found that to be the case with Virtos, a DirectX8 plug-in running under Cool Edit. 5.2.6.10 There is some debate as to whether noise reduction tools for the removal of audible clicks, hiss etc are more effective when used before an equalisation curve is applied rather than afterwards. The answer very likely varies according to the specific choice of tool and the nature of the job to which it is applied, and in any event will be subject to change as tools continue to evolve. The most important point in this regard is that noise reduction equipment, even fully automated tools with no user-definable parameters, ultimately employs subjective and irreversible processes, and so should not be used in the creation of archival master files. We have indeed discussed the problem with linear phase DSP RIAA decode. It turns out that DC8 from Diamond Cut does follow analog phase characteristics; Cool Edit's FIR did not. Scott Wurcer has posted here his link to the Linear Audio article he's written. Just got some OPA1612 SMT/DIP adapters from Brown Dog/Cimarron Technology to see how they compare in the flat preamp. The 1612's use TI's Silicon/Germanium process in an NPN bias-compensated input. The input voltage noise density is 1.1 nV/sqrtHz with a low 1/f corner. The current noise is higher than the NJM2114 at 1.7 pA/sqrtHz vs. 0.4 pA/sqrtHz. The OPA1612 - if it doesn't have the burst noise of the LME-series should be a good SMT replacement for the now discontinued LME49720. mediatechnology wrote: Just got some OPA1612 SMT/DIP adapters from Brown Dog/Cimarron Technology to see how they compare in the flat preamp. is there any easy way to check start-up behavior a classic ding against bias-compensated parts? (I guess very high impedance circuits). I vagues recall some slightly better uber op amp numbers but down that low it is academic IMO. PS: A late comment on you previous post regarding single ended noise reduction applied pre- or post RIAA. It seems like a no brainer to apply anti-click processing before the RIAA (LPF) smears and attenuates out of band content. Single ended hiss reduction could reduce hiss associated with the RIAA eq too, but I expect that to be insignificant. I have had a chance to run a noise comparison of the NJM2068DD and OPA1612. My first test run was with an open input. The source resistance is 47K. Flat Phono Preamp Noise Floor NJM2068DD (Blue) versus OPA1612 (Red). Rsource 47K Ohm. The higher current noise of the OPA1612 is obvious. I also ran 2K Rsource measurements - a more realistic approximation of a cartridge than an open input - and the curves essentially overlaid. The OPA1612 is still a contender but I'm beginning to appreciate the NJM2068 even more. I'll be posting measurements with a real cartridge to see if the NJM2068DD remains the low noise King. The start-up behavior of the OPA1612 is worth looking at. I'll use the same test circuit as the LME49720. Ran some noise measurements using the Stanton 681 mounted on the tonearm comparing the noise performance of the OPA1612 to the NJM2068DD and OPA2134. 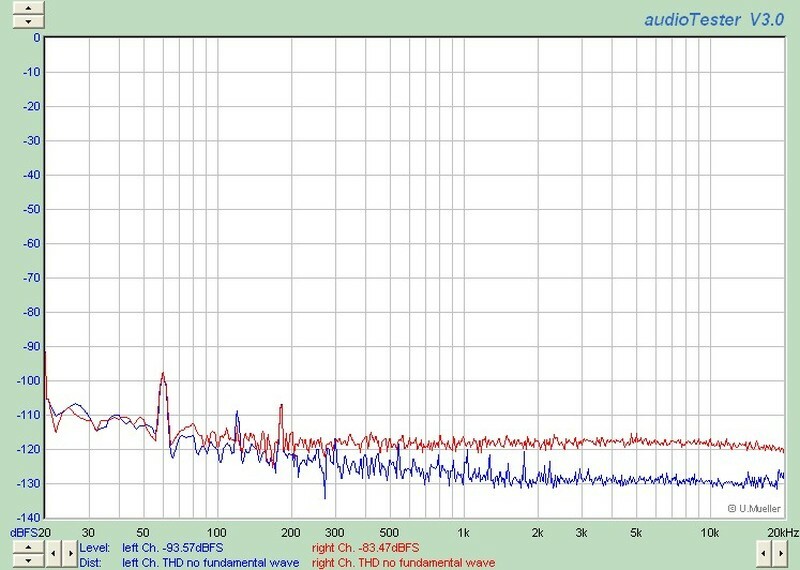 The Flat gain is approximately 30 dB. I didn't post the OPA2134 versus NJM2068 results because they are essentially identical. The OPA1612 is definitely noisier most likely due to its bias-current cancellation and higher resulting input current noise. I put the OPA2134s back into the preamp and will be using them. The OPA1612 is going into the RIAA EQ stage. mediatechnology wrote: I didn't post the OPA2134 versus NJM2068 results because they are essentially identical. Do you mean OPA2134 & NJM2068 have similar noise performance with Stanton 681? Yes, they are very, very close. You can compare the green traces in the post to compare the OPA2134 to the NJM2068. Side by side the '2134 and '2068 virtually overlaid so I didn't capture the plots. In fact the NJM2114, the NJM5532, OPA2134 and NJM2068 are all very, very close with a cartridge as a source. With a 2K Rsource the OPA1612 and NJM2068 have similar noise signatures. With a cart it is an entirely different story with the NJM2068/OPA2134 being much quieter than the OPA1612.